From sunset Friday, January 10 until at least 2am, January 11, 2014, safe food activists will be holding a nighttime vigil outside of the FDA’s Center For Food Safety and Applied Nutrition (5100 Paint Branch Pkwy College Park, MD 20740) to demand the FDA require mandatory labels for foods containing genetically engineered ingredients. 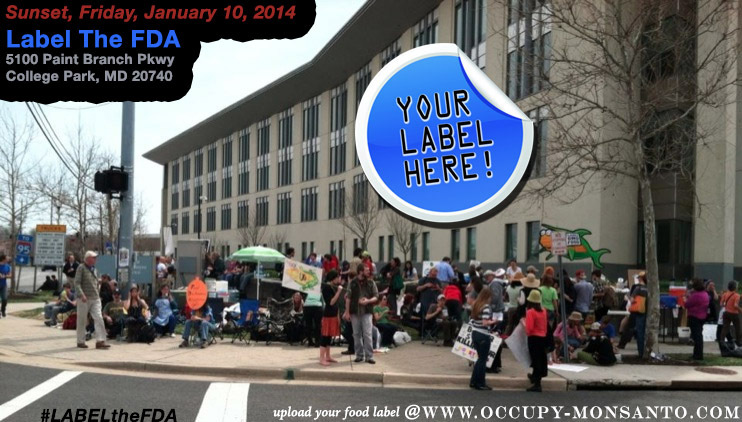 Throughout the evening activists will be projecting crowdsourced food labels, photos, and videos submitted by concerned citizens from around the world on to the side of the FDA building. 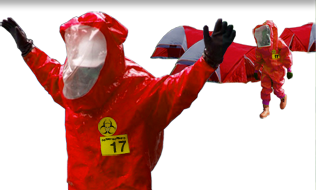 This demonstration will be taking place at night in the middle of the winter and we anticipate COLD weather. Organizers will bring outdoor heaters and some blankets, but it is advised to bring hand & toe warmers, a warm winter jacket, wool socks, long underwear, blankets, folding chairs, flashlights, a tent & sleeping bag (if you plan on staying overnight), thermos of coffee or tea, signs, and the desire to get the FDA to require mandatory labels. The FDA’s Center For Food Safety and Applied Nutrition is located at 5100 Paint Branch Pkwy College Park, MD 20740. The building is conveniently located across the street from the College Park Metro Station on the Green Line. We recommend using a SmarTrip card (available for purchase at any station, except Dulles & BWI airports) to bypass the $1 surcharge on paper tickets. If coming by Bus or Train, take the Red Line from Union Station in the direction of Shady Grove to the Gallery Place Station, change trains to the Green Line (on the lower level) in the direction of Greenbelt, and get off at the College Park Station. If flying into Reagan National Airport, take the Yellow Line train in the direction of Fort Totten to the Gallery Place Station, change trains to the Green Line (on the lower level) in the direction of Greenbelt, and get off at the College Park Station. If flying into Dulles International Airport, take 5A Bus ($6 exact fare – pickup located at Curb 2E) to the L’Enfant Metro Station, take the Green Line in the direction of Greenbelt, and get off at the College Park Station. If flying into BWI Airport, take the B30 Bus ($6 exact fare – pickups located at Concorse A and E. Follow the signs that say “Public Transit”) to the Greenbelt Metro Station, take the Metro one stop and get off at the College Park Station. The Washington Metro runs until around 2am and restarts at 7am on Saturday morning. We know that it may be difficult for many of you to attend in person, but you can still participate by submitting your photos, videos, and mock gmo food labels (upload form below). If you can’t attend in person, please select “Maybe” on the Facebook event page and invite all your friends. If you can come, please select “Going” and invite your friends! What does GMO labeling mean to you? What would a GMO label look like? How would you like to label the FDA? 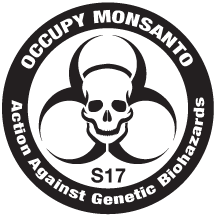 Do you have video of your March Against Monsanto you’d like to share? Do you have photos from your city’s March Against Monsanto you think would look nice projected on to the building? In order to prepare the multimedia for projection on Friday, January 10, the window to upload graphics ended on Wednesday, January 8. THANK YOU to everyone who contributed! Check out the Photos & Videos from our last visit to the FDA’s Center For Food Safety and Applied Nutrition last April!